Everyone experiences occasional sleeplessness. However, chronic difficulty sleeping can affect your mood and physical health. 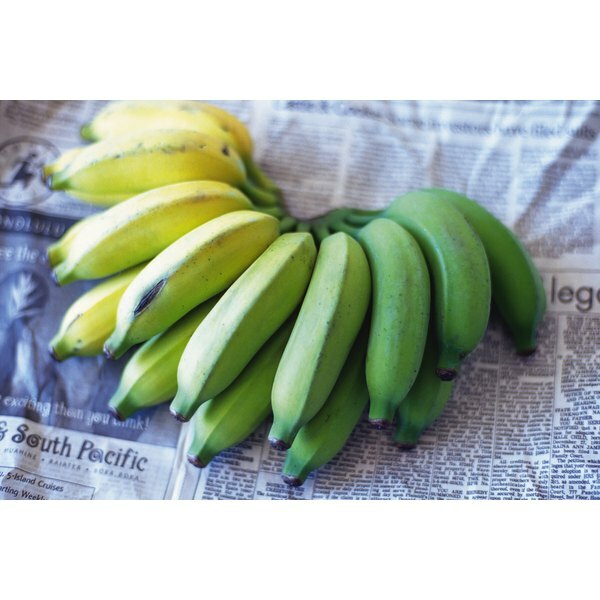 While a number of medical treatments can help, some research has shown that tryptophan, an amino acid naturally present in foods like bananas, may improve some of the symptoms of insomnia. Consult your doctor if you suffer from persistent insomnia. Tryptophan is an amino acid found in a variety of foods, including bananas, red meat, eggs, cottage cheese and chocolate. A small amount of tryptophan is converted into niacin, or vitamin B-3, by your liver. Your body also uses tryptophan to produce 5-HTP, a compound which is then used to manufacture serotonin and melatonin, two important mood and sleep-regulating neurotransmitters. In order for your body to convert tryptophan to niacin, you must also have enough dietary iron, riboflavin and vitamin B-6, according to Medline Plus. If you do not have an adequate intake of foods containing tryptophan, you may suffer negative side effects, such as depression, irritability and insomnia. Bananas contain high amounts of a number of important nutrients. One medium banana contains 105 calories, 0.39 grams of fat and 0.011 gram of tryptophan, according to the USDA National Nutrient Database for Standard Reference. Additionally, bananas contain 0.086 of riboflavin, 0.31 of iron and 0.433 of vitamin B-6, nutrients that you need in order to convert tryptophan into into niacin. A clinical review published in 1986 in the journal "Psychopharmacology" evaluated the benefits of tryptophan for insomnia. The authors found that tryptophan was beneficial for people with situational insomnia, meaning that falling asleep is difficult, by reducing the time it takes to fall asleep in doses ranging from 1 gram to 15 grams. Tryptophan was also found to be useful in patients with chronic insomnia when repeatedly administered in low doses over time. Another review was published in the December 2005 issue of the journal "Acta Medica Indonesiana," the official journal of the Indonesian Society of Internal Medicine. It evaluated sleep patterns and insomnia among geriatric patients and the authors suggest that eating foods that contain tryptophan, like milk or bananas, can improve symptoms of insomnia. While dietary changes may help to relieve insomnia, you should consult your doctor if you experience prolonged insomnia, especially if self-help techniques and lifestyle changes do not help. Do not attempt to self-diagnose your condition. Insomnia can be a sign of a more serious underlying medical condition.